“Marc Lewis vividly conveys the alluring yet dangerous universe of mind-altering drugs and the painful paths of addiction and recovery. His experiences with LSD, heroin, and other powerful chemicals are woven together with clear explanations of the brain mechanisms underlying drug effects and addiction. 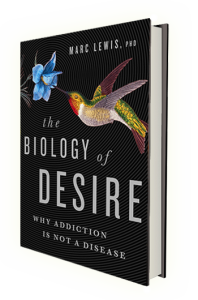 Beautifully crafted and illuminating on multiple levels, this is a book you won’t want to set down.” Kent Berridge, PhD, James Olds Collegiate Professor of Psychology and Neuroscience, University of Michigan.